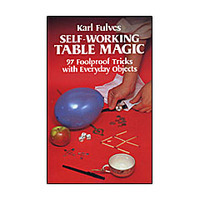 Today, when you order "Self Working Table Magic by Karl Fulves", you'll instantly be emailed a Penguin Magic gift certificate. You can spend it on anything you like at Penguin, just like cash. Just complete your order as normal, and within seconds you'll get an email with your gift certificate. The quickest, most certain path toward achieving a reputation as a magician is to be able to perform at a moment's notice with borrowed objects. If you are handed a coin, handkerchief, pencil or rubber band, you should be able to do at least one amazing trick with that object. Some chapters have been designed to provide the reader with a complete act of close-up magic. For example, the chapter entitled "Magic Show in a Matchbox," gives you about 15 minutes of excellent tricks and stunts to amaze and amuse your audience. Master the tricks in this book and you will be ready to entertain anytime, anywhere, with some of the finest of all close-up mysteries. Karl Fulves, editor of Pallbearer magazine and one of the most renowned modern writers in the field of magic, has selected these tricks from both old and new magic stunts. Some are classic feats of time-tested wizardry, while others are new and inventive techniques. All, however, are easy-to-learn foolproof routines that will enable you to dazzle and delight your audience. Paperbound, 122 5 3/8" by 8 1/2" pages, 185 illustrations. That is about all I can say after picking up this book again. For a bit of background, I picked up this (along with all the other "self-working" books at a bookstore back when I was just starting magic. I can go ahead and say that the bookstores were charging more than penguin does already. Anyway, this book contains TONS of various routines that are all FANTASTIC and ready for shows. Don't discount this book (or any of the others) JUST because they are centered towards beginners; I have found material in here that would work JUST as well in a proffesional's stage show as would a 500 dollar close-up gimmick. The real value of this book however is in the fun impromptu routines that it teaches with stuff, the pen section, and the dice section. I learned a lot of routines I have been doing ever since from this very book. Highly recommended for the beginner and expert alike! Plus, it is SUPER cheap! when we was children, usually we knew a person, that it enchanted or it astonished to us with small effects that they defied our brain and that little by little they woke up our interest by the magic. This books are a treasure trove of great magic. Many of the included tricks are used by successful professional magicians. Admittedly, these are best used in a program with other, more elaborate tricks, but for those moments in your act where you need a short, sweet effect, something in this book might just fill the bill. And as you get more proficient in magic you will find ways to further embellish these tricks and make them your own private miracles.